Need a flexible, non-phone, work from home job? Google work from home jobs offer one of the more flexible options as far as working when you want as frequently as you want. 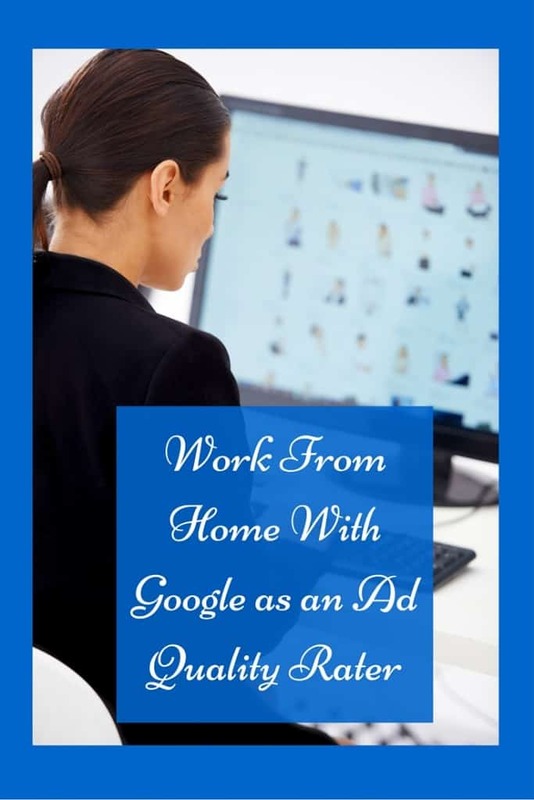 This position for Google ads quality rater is similar to the other Google work from home positions we have shared except you will be rating ads within the search engine results. Google Work From Home Jobs: What is an ads quality rater? As an ads quality rater you would work to help the search engine improve ads so that they are as relevant as possible. You do this by evaluating ads that have been placed within search engine results. By adding a human element to this process, Google can get feedback and improve the relevancy of ads. Ads Quality Raters are given sample search terms, and then shown potential advertisements that would be placed with the search results. You then provide feedback and analysis by submitting a rating. Although your work may involve reviewing ads in another language, your ratings will be written in English. You do not have to be super tech savvy for these positions because what search engines want is a regular internet user’s feedback on what ads would be the best fit for specific searches. The great thing about these Google work from home jobs is once you get hired the system is available 24 hours a day 7 days a week. You can log on and work for 20 minutes or for 3 hours, it is completely up to you. This makes it a great fit for stay at home moms because you can hop on during nap time and do not need to worry about being in the middle of a big project once nap time is over. It is also a great fit for those that have a full-time job and want to use this as a side hustle to make some extra cash. You can work early in the mornings before you go to work or late into the evening while you are catching up on your favorite Netflix shows. The downside of these Google work from home jobs is there is little to no interaction with supervisors or really anyone else you work with. If you are someone that does not do well with no supervision then this work from home job may not be the best fit for you. Also because you do not have to commit to working specific shifts like some of the other telecommuting jobs you have to motivate yourself to commit to the minimum hours needed a week to stay employed with this company. The only other downside is that because you will be hired as an independent contractor you will receive no benefits and no taxes will be taken out of your paycheck. This means you need to evaluate your family’s tax situation and decide based on how much you will be working if you need to make estimated tax payments so you are not stuck with a big tax bill when tax time rolls around. How do I get hired for these Google work from home jobs? Generally these Google work from home jobs hire in English and other languages as well. Some of the positions require that you speak a second language. You must live in the United States. Don’t get discouraged if you don’t hear back right away. Google does not usually hire directly for these positions directly but instead in the past has used a third party company, Zero Chaos. This may have recently changed and they may be using other companies now to hire for these positions. Pay usually starts at $15 per hour. You must have a four year college degree to be accepted. You must provide your own computer and internet service. If you do apply for one of the positions that requires a second language then experience as a user of that specific country’s internet and print culture is required. All of those that apply must be able to read and write English well. Hours range between 10 to 30 a week but are flexible based on your availability. New hires also agree to sign a non-disclosure agreement to keep information about the company private. Once you apply if the company contacts you then you will be required to pass a test before being hired. Study materials are provided but you are usually only given one chance to prove you understand the concepts and how to apply them to this position. You can apply at the ZeroChaos career website but if you do not see any of these positions listed check back often as they hire for them frequently. They also frequently advertise these positions on Career Builder. If all else fails you can try googling “ads quality rater jobs” to check for online job postings but beware that others may use this as a scam. Google and any other legitimate company hiring for these positions never requires any fees or any other costs upfront. You can also find other companies that hire for these positions on the work from home companies page. This post may contain affiliate links but I never recommend any products or services that I don’t believe in.